December 18, 2017, 2:16 p.m. 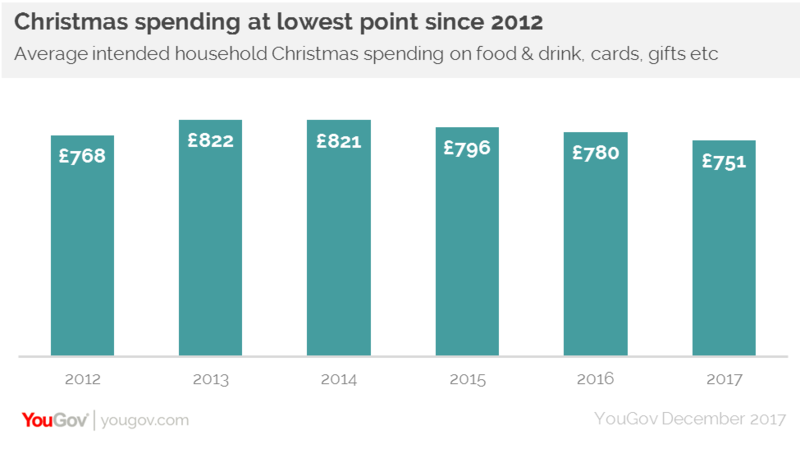 The average amount that households expect to spend on Christmas has fallen again – this time to its lowest level since YouGov first started tracking this measure in 2012. Research for our‘Christmas Spending Intention’ report reveals that the average British household that celebrates Christmas, will spend £751 for the festive season on gifts, food and drink, and decorations, trees and cards this year, down from £780 in 2016. Overall, three in ten (29%) expect to spend less money as at Christmas 2016 while four in ten (41%) people say they expect to spend the same. A further 27% anticipate spending more.. The study shows a socio economic divide in intentions to cut back at Christmas. Indeed, those in the ABC1 social grade are expecting to reduce their spending on food and drink by 5%, while those in the C2DE group are anticipating spending 1% more. Among those that are expecting to cut back, 58% say they simply have less money to spend this year, while 46% want to reduce how much they consume/buy during the festive season. One in five (21%) say they have set a budget this year.